We are proud to announce that we now have a House Host Tracker thanks to @Harudoku. It allows us to add and remove open hosts on the host list for both OSRS and RS3. This list is shown in a table format on our Portal page, Forums page, and on Discord. This will be very helpful for those training Prayer to a certain goal e.g. level 99, 120 or 200M XP. OSRS - World 330, Rimmington or Yanille. RS3 - World 31, Yanille. For the majority of players in the community, you will have access to the basic commands. They will allow you to let others know you're hosting and/or be aware of who's hosting. However, if you are an "Altar" FC rank, an "07 Altar" cc rank, or a house host tracker helper (HHTH) that is volunteering to help out with updating the tracker, many commands are available to you. We encourage you to make use of those commands on a regular basis to ensure the host list is up to date. If you ever need help with a particular command, type !help <command name>, and the tracker will give you a description about the command. For example, if you are unsure what the verify command does, type !help verify. 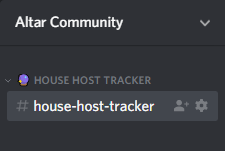 For more immediate assistance with the House Host Tracker, you are more than welcome to join Discord. Note: If you are an unverified host, the mods/admins will list you as an unverified host. Your hosting hours WILL NOT be tracked if that is the case. Type your RuneScape display name. Type either OSRS or RS3. Type either Thieving or Construction. You should only use the Construction method if your Thieving level is not on the hiscores. Type y to verify your hiscores XP in either Construction or Thieving. Type y after following the instructions. This requires you to log into RS3 or OSRS to gain some XP in either skill. Once you become verified for OSRS or RS3, you can type the !host command when you have started hosting and the !unhost command once you have stopped hosting. Your hosting hours will be added to your total time hosted once the !unhost command has been typed. There are autotyping programs created by @Im Dakota and @Lusfr_ that automatically check the host list on the House Host Tracker every 30 seconds. They are usually found in each hosting location for OSRS and RS3 thanks to dedicated volunteers in our community. If there are none in a particular hosting location, feel free to tag them @OSRS HHT Advertiser or @RS3 HHT Advertiser on Discord. However, please bear in mind that these advertisers are offering free advertising services, so there is no guarantee that there will be one available for each hosting location at all times. !help - brings up a list of all commands available to you. !help <Command> e.g. !help adminhost - gives you helpful information about the command. !verify - verifies you as a host with a high enough Construction level to have a Gilded altar . This requires searching your in-game name on the hiscores and verifying that you have the appropriate Construction level to host. If that passes, you will be given two choices: Thieving or Construction. The purpose of this is to ensure that you are a member and that the name you chose belongs to an account that you are on. You should only use the Construction method if your Thieving level is not on the hiscores. !hosts - lists all OSRS and RS3 hosts. !host e.g. !host rs3 yan - adds you on the tracker's open house host list. You must be verified to use this command. !unhost - removes you from the tracker's open house host list. You must be verified to use this command. !stats - checks your verified host status, activity score, time hosted, and whether you are a user/moderator/admin. !leaderboard commands OR !leaderboard hosts - lists everyone based on command activity score or hosting hours. !done - ends your current command so that you can type a different command. [Mod/Admin] !namechange - changes your display name without verification. [Mod/Admin] !allhosts - sends you a DM (Direct Message) that lists all verified RS3 and OSRS hosts. [Mod/Admin] !osrscheck - cancels out the 3 hour notification that reminds ranks to check whether the OSRS hosts are up to date. [Mod/Admin] !rs3check - cancels out the 3 hour notification that reminds ranks to check whether the RS3 hosts are up to date. 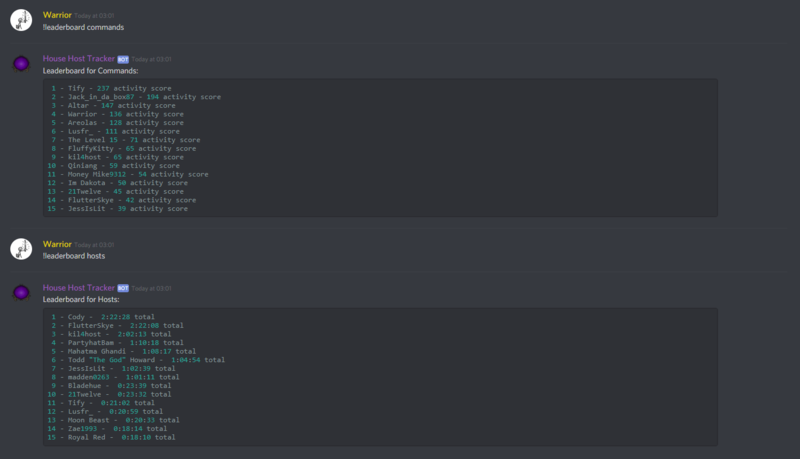 [Mod/Admin] !host -a @Discord user - lists a verified host on the tracker. This will behave in the same way as !osrscheck or !rs3check. [Mod/Admin] !unhost -a @Discord user - removes a verified host from the tracker. This will behave in the same way as !osrscheck or !rs3check. [Mod/Admin] !proxyhost, !adminhost, !ahost, !ah "<Host RSN>" e.g. !ah "hello world" os 30 yan - lists an unverified host on the tracker. This will behave in the same way as !osrscheck or !rs3check. [Mod/Admin] !proxyunhost, !adminunhost, !aunhost, !auh "<Host RSN>" - removes an unverified host from the tracker. This will behave in the same way as !osrscheck or !rs3check. Description: Using the !help command to list all available commands. Note: If you would like more information about a certain command, type !help <Command> e.g. !help adminhost. Description: Using the !hosts command to list all open house hosts. Description: Using the !stats command to bring up your verified host status, activity score, time hosted, and whether you are a user/moderator/admin. Description: Using the !leaderboard commands and !leaderboard hosts commands to bring up the leaderboard of all House Host Tracker (HHT) users for both Commands (activity score) and Hosts (time hosted). Description: Using the !done command to end my current command i.e. !host. This command DOES NOT work with Discord usernames. Quotation marks are not required for the username. Do it separately as demonstrated in the image below. This command only works if you are a verified host. You can type abbreviations for the RS3 or OSRS location e.g. Yan for Yanille, Rim for Rimmington. You no longer have to just type the number for the OSRS world e.g. w330 for the OSRS world. Description: Using the !unhost command to display to everyone that I am no longer open for OSRS. Note: This command only works if you are a verified host. Description: Using the !namechange command to change my RuneScape username that displays on the open host list. This has no effect on your in-game name, and you will not need to verify yourself again. Note: This command only works with verified hosts by tagging their Discord username. Type everything in one line. Examples: !proxyhost "username" rs3 yanille, !proxyhost "username" osrs 330 rimmington. This command should only be used for unverified hosts (shows an asterisk * on the House Host Tracker). Discord usernames DO NOT work with this command. Description: Using the !proxyunhost command to display to everyone that "test 123" is no longer hosting for RS3. This command only works with unverified hosts (shows an asterisk * on the House Host Tracker). Description: Using the !host -a @Discord user command to display to everyone that "Maxsi" is now hosting for OSRS. Note: This command only works with verified hosts by tagging their Discord usernames. Description: Using the !unhost -a @Discord user command to display to everyone that "Altar" is no longer hosting for OSRS. Description: Using the !osrscheck command to confirm that the tracker is up to date with OSRS hosts. Description: Using the !rs3check command to confirm that the tracker is up to date with RS3 hosts. Description: Using the !allhosts command to list all verified hosts. Note: You will receive a DM (Direct Message) when you use this command.